will be 8' - 10' wide with 2' shoulders. 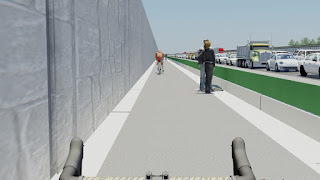 It’s great that the Transform I-66 Outside the Beltway project will include a 22.5 mile bicycle/pedestrian trail. 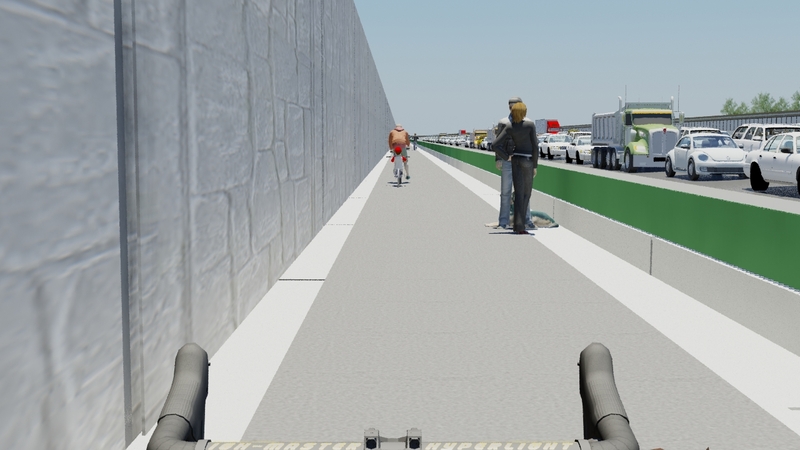 We’re concerned, however, that VDOT specifications for the trail have shortcomings that will undermine a user-friendly experience, dramatically limit its utility, and risk creating a trail that will be under-utilized. So, we’ve created this simulation to help people visualize what the trail will be like for major portions of its length. Please check it out. We have three major opportunities in the coming week to provide input to VDOT for making the trail more user-friendly, safer, and more likely to become a successful transportation option. Details on the meetings and some the proposed trail’s shortcomings are in this FABB blog. Now is the time to speak up! Please plan on attending one of the meetings in Oakton, Centreville or Bistow this week or on sending comments to VDOT at Transform66@VDOT.Virginia.gov. Nice looking simulation. Seems like this would be particularly unpleasant going eastbound in the dark, with headlights shining right in your eyes.